With spring finally taking off and a much nicer weather it’s time to enjoy our gardens. It’s a busy time of year for garden designers and landscapers and more generally garden lovers. Here is another recent example of a medium-sized garden for a new built in Wivelsfield , West Sussex. As it is often the case on new development, neighbour’s windows overlook the garden and fences predominate as there is nothing else to enjoy. However, a blank canvas is a great opportunity to create an exciting and functional garden to be enjoy by all the family. Large borders to soften the boundaries. The client wanted a cottage garden style for the planting. We will use a mix of evergreen shrubs which provide a permanent structure and a profusion of herbaceous perennials with a year-round interest. A pergola with a barbecue to create an intimate area surrounding by large borders. Along the fence, large pleached trees will create an instant screening and provide a greener environment. A more formal garden with a bench to enjoy the calm of the surrounding countryside. Trellis and climbers will be used to cover the existing fence and a large brick wall. Out of the main view, a functional area where we will fit a shed, a washing line, a compost bin and a bin storage unit. The palette material is quite simple. We will reuse the same existing materials to provide harmony through all the garden. Small trees will be used for heights and volumes. Despite the size and the shape of the garden, we can still create different areas with different atmospheres. 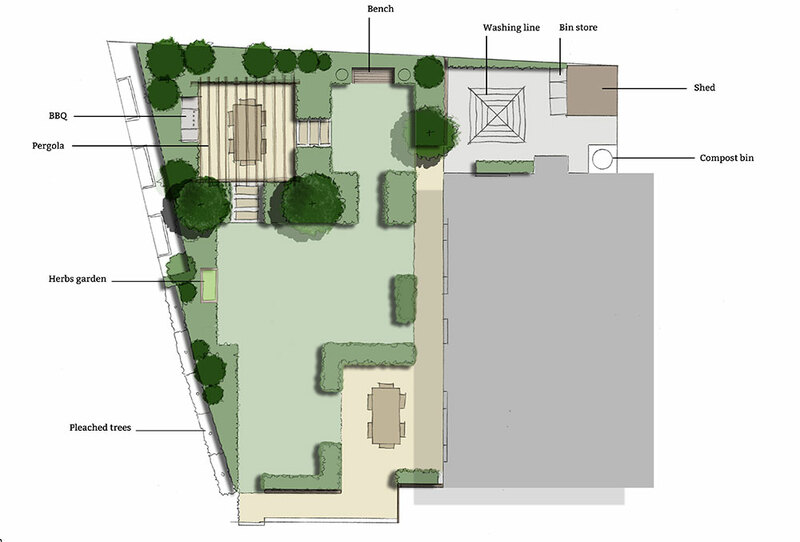 If you would like to redesign your garden please ask for a consultation. As a garden design studio based in Haywards Heath we offer local and client focused garden design services in the Sussex area and beyond. Our garden design process normally start with a first initial consultation to talk about your needs and to analyze your garden.